I rose fairly early and packed up my camp, taking one last look at the surrounding beauty of the upper Green River and the towering peaks with their nearly sheer cliffs. I slowly drove down the gravel road that led back past the Big Bend and slowly, over about ten miles, turned from north to south before coming to Wyoming State Highway 352 and the pavement. From there I followed that state highway south to U.S. 191 and then proceeded north along that two-lane ribbon past many mountains and wildernesses that I have not yet explored. So, as I drove by I attempted to get a feel for the land, but that is nearly impossible when traveling sixty-five miles and hour. At some point between Pinedale and Hoback Junction, Wyoming, the road passes over a small divide that separates the Colorado River drainage from that of the Columbia River. While not quite as monumental as the Great Divide, this parting of the waters is still nonetheless significant, separating two great river systems. The road leads into the Hoback River drainage, which flows into the Snake River, and my understanding is that the name Hoback dates to the era of the mountain man, although I don’t know the story behind the naming beyond that it was most likely given, somehow, in honor of John Hoback. I followed the Snake River downstream via U.S. 26 and stopped at Alpine, Wyoming, for breakfast before continuing on into Idaho. At Swan Valley, Idaho, I turned north on Idaho State Highway 31 and followed that narrow highway to Victor where I began to follow S.H. 33 and then S.H. 32 to Ashton, Idaho. At Ashton, I followed S.H. 47, which was old U.S. 20, along a scenic alternative. Eventually, the state ended its maintenance and the road continued on as a Forest Service road. The entirety of this day’s drive was scenic Rocky Mountain splendor; and I especially enjoyed seeing the western side of the Teton Mountains and passing by the Henry’s Fork of the Snake River; as this area was historically important in the fur trade and many tales from those days flooded back as I passed well known landmarks. My scenic alternative allowed some great sights of the Henry’s Fork passing through its canyon of basalt. Following U.S. 20 east once the Forest Service road rejoined the main highway, I passed through numerous open meadows surrounded by coniferous forests in the vicinity of Island Park, Idaho. At S.H. 87 I turned north and passed over Raynolds Pass and into the drainage of the Missouri River. A few miles later, I made a junction with U.S. 287 and turned right, southbound but upstream, and passed Earthquake Lake, a natural lake formed recently, in 1959, when a large earthquake sent down a massive landslide that blocked and inundated the Madison River. When I made yet another junction with U.S. 191, I turned north and passed into Yellowstone National Park on its relatively seldom seen western side. My immediate goal was to hike in the northwestern portion of the park, as, while it may not be the most strikingly scenic area, it does contain good wildlife habitat. Its low-elevation habitat, free from cattle and barbed-wire fences, are unusual as most such habitat has been converted to agricultural use throughout the Rocky Mountains. I found the Bacon Rind Trailhead and began to hike along Bacon Rind Creek Trail, which parallels the eponymous creek. As I expected, this creek passed through a large, continuous meadow with tall, lush grasses and forbs that cure well and make great feed for elk during winter. As yet, the elk and most other wildlife were still grazing up high in the snow-free mountains and I did not see much sign of them. I followed the trail the two miles to the park boundary and then continued on into the Lee Metcalf Wilderness portion of the Gallatin National Forest. I eventually climbed a small ridge and found a great view of the headwaters of Bacon Rind Creek, thankful that this area was legislatively protected. All around there are distant peaks and I am hopeful that in the future I will be able to explore the area, and experience for myself the sub-alpine and alpine heights of Red Mountain, not too far to the west from my ultimate stopping point this day. The forest covers many square miles here, filtering the air and cleansing it of carbon dioxide while simultaneously fortifying our atmosphere with oxygen. The air is clean, and it is with great pleasure that I fill my lungs. The water, also, is clean and tumbles over the rocks, clear and cool, providing habitat for cutthroat trout and other aquatic species. Sadly, it cannot be guaranteed that Bacon Rind Creek and other waterways are free of giardia. 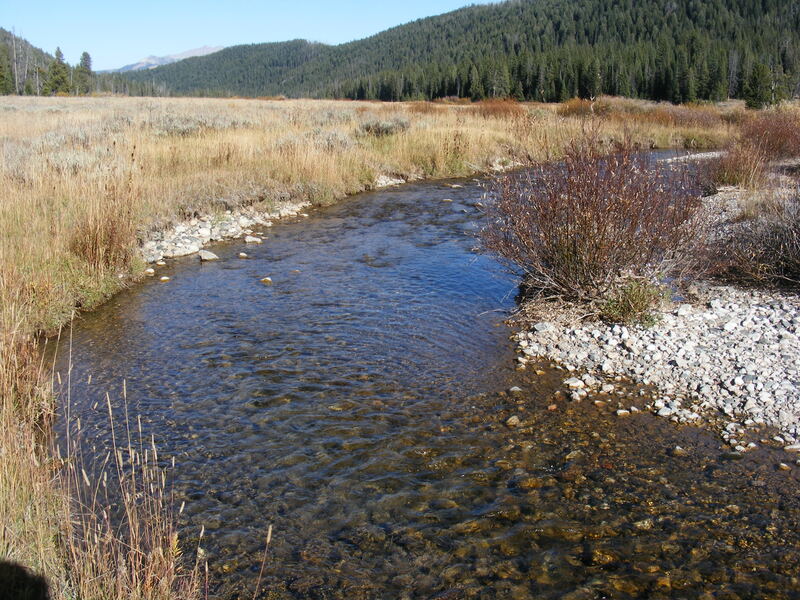 But, the insects are a good indicator that overall the health of this free-flowing creek is positive. On the ridge, there was some old sign of elk grazing nearby, but at this time the elk were elsewhere. Nor did I see sign of wolves or grizzly bears. But I know that with fall coming on swiftly that the elk and other critters would be returning to this area soon. It was especially gratifying to hike through an area that was not fenced off for cattle and other livestock. After returning to the trailhead, I drove a short distance north and passed out of the park. There are not Park Service campgrounds in the area, so I camped out at the Tepee Creek Trailhead, where the next day a fine hike and adventure would await me. I made a small campfire and enjoyed the starry sky. I saw a moose and her calf on the opposite shore of the Gallatin River before the sun set and was happy to know that I was in a wild and protected landscape. I will firstly say that this has to rank in the top three of all hikes I have done based on sheer beauty of landscape. Perhaps it is my favorite ever, such was the combination of sub-alpine forest, open meadow, glaciated stream, epic mountain peaks and large, serene lakes that produced this salubrious setting. I rarely have had such a difficult task as to choose the header photo; which out of a dozen potentials should I choose? Normally, I don’t have but one obvious standout snapshot, or, thankfully rare, have to settle for the photo which is the least heinous. This day hike is an expanded trek from the one that I had walked the previous year. That hike had been around the circumference of Lower Green River Lake. Today, I wanted to do that same hike but only make a further trek along the Green River past the Upper Green River Lake. Planning for this hike, I had recollected the stunning natural beauty of this wild basin. There are no superlatives that adequately describe what I saw. The remnant of ice age glaciation are inherent in the valley’s curved sides and the presence of the moraines that allow the lakes to form. The Green River above the upper lake also carries a load of glacial silt that gives the upper river its turquoise coloring. 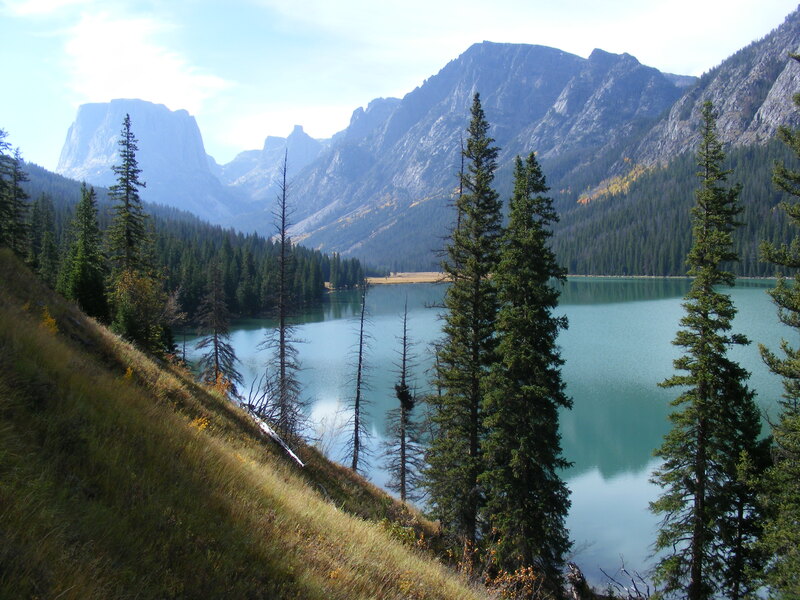 I began my hike along the western shore of Lower Green River Lake, which stretches out for two miles. This shore is heavily forested, and the morning fog produced that silence found in all such forests worldwide. The lake was still, and when I could catch a glimpse of the waters through the thick forest, I saw not the other shore but a wall of grey mist. When I reached the meadow at the inlet to the lower lake the mist began to rise and within fifteen minutes it was evident that a fine fall day awaited. The burned-off fog transmogrified into blue sky and through the evaporating haze became evident the high peaks standing sentinel over the valley below where I stood. The meadow’s grasses and brushes had taken on the red and gold hue of autumn and glowed where the morning sun lit the dew drops and made them sparkle. I walked over to the Green River and found a place to rest on a small patch of washed gravel. I had a fine view of the river and spied four mergansers going about their business. All was still and peace, excepting the river in my immediate foreground, flowing inexorably onward as gravity dictates. I then crossed the Forest Service bridge and made my way to Upper Green River Lake. Passing from the forest into a meadow I was greeted by a most pleasing combination of mountain and lake. It was hard for me to believe that such a graceful place actually existed and wasn’t just an illusion or a product of an artist’s imagination. At this moment I knew that it had been well worth my time to return to the Green River. This is why I get out and hike and explore. Next time, I will have to spend a night or two in this magnificent location. The upper lake is the small of the two and its shoreline marks about a mile, approximately half the distance of the lower lake. This upper lake seems to serve as a settling basin for the upper portion of the Green River. The color has some of the opaque turquoise quality that the incoming waters have. The outflow below the upper lake is clear and seems like most waters running out of the mountains. I had not suspected that the waters above the upper lake would have the appealing quality of color that it did and I was treated to further scenes of grandeur. I walked another mile or so above the upper lake and found place to sit that provided a fine view of Squaretop Mountain and the surrounding valley. I sat mesmerized by my surroundings able to do naught but give blessings of good tidings to the Creator for allowing such a day to exist. Eventually, after resting my muscles, soothing my conscience and fueling myself with a well considered, tasty and nutritious hiker’s lunch, I rose from my chosen spot and made my way back down the trail. I first took time to explore the immediate surroundings, especially focusing on walking along the peaceful river that winds through the meadow, never hurrying along, but wide and deep. The return hike was just further cemented into my mind that I was blessed to have had this day. Late September in the mountains on a still, blue sky day: It doesn’t get much better than that. Warm, but not hot; no flowers, but the golden hued vegetation is a fine substitute. I walked back past the bridge but instead of crossing it I continued to hike along the eastern shore of Lower Green River Lake. There was, prior, another, much smaller, bridge crossing Clear Creek. The delta of the inlet to the lower lack was one large meadow full of life. From this point, there are four or five different ways to go, and I have barely explored but one or two. Vast and beautiful are the two words that barely sum up my feelings. I don’t know what the future will bring, but I look forward to the next time I visit these mountains. This forthcoming blog post will describe the first day of a multi-day adventure to the greater Yellowstone region. Ah, Yellowstone… the word itself is magical and brings forth connotations of earthly wildness and the best that the Rocky Mountains have to offer. The world’s first National Park is here and some would say that the national parks are the best American idea to grace the world. I was fortunate in my younger days to have worked and lived in the region, the net result being that I still have a (semi) local’s knowledge of the area. That knowledge has been idle the last decade and a half, but still remains, ready to be brought forth from the recesses of my mind. This was the second year in a row that I have been able to visit the Greater Yellowstone Ecosystem (and I truly hope to make it three in a row this fall). The only difference was that last year I visited at the end of October and this year I visited at the end of September. It was wetter this year when I visited, similar to what I would have expected had I remained in Colorado; I bore witness to the last remnants of what we like to apply the misnomer of monsoon to what are really summer rains and thunderstorms. The previous afternoon I had dropped the dogs off at the kennel and had packed up the car, ready to go out for a week’s worth of car-camping, hiking and exploring not only Yellowstone National Park, but the greater ecosystem that surrounds the park. By dropping the canines off the day before, I was able to leave first thing in the morning. And, really, by first thing, I meant four ante meridiem. Not even a hint of first light was in the sky when I fired up the ol’ Outback and departed west from Gunnison, Colorado, following U.S. 50 to Grand Junction, Colorado, and then making my way via Colorado State Highways 139 and 64 to Dinosaur, Colorado and U.S. 40 where I made my way west to Vernal, Utah. At Vernal, I traveled north on U.S. 191 and followed that route over the Flaming Gorge Dam and all the way to Pinedale, Wyoming. I did not stop to take photographs along this entire route, something I now regret but at the time I was eager to make miles. At Pinedale I stopped at the Bridger-Teton National Forest ranger station and bought a copy of the map for the Bridger Wilderness Area. Just like last year, I made my way up Wyoming State Highway 352 to its terminus where the pavement ended and the gravel road began. This road, Forest Service Road 650, terminates at the Green River Lakes Campground. Unlike last year, where I made the long drive up from Pinedale and then only hiked a few miles before returning down the road and continuing my adventure elsewhere, I planned on staying for two nights at this campground so as to better explore and enjoy this vast wilderness. Even at that, with two nights at my disposal, I would hike only a trivial amount relative to the vast mileage found throughout the Wind River Range in general and the Bridger Wilderness specifically. For the two decades (and more if I were to count the family trips made in the nineteen eighties) prior to the previous year I had driven by the Wind River Range without once bothering to stop and explore the high peaks and deep canyons that these mountains are well known for. I will say that the northern part of this range, the only part that I have yet to visit, is one of the most majestic locations that I have ever been fortunate to view with my own eyes. Although I had driven swiftly by many places worthy of stopping and exploring, I was also happy to arrive at the campground and have camp set up by two in the afternoon. I was feeling motivated and ready to get out and hike. Before I had left on my journey, I had perused the map and already know where I wanted to hike on this first day. Most of my hike was not in the wilderness area itself, but in the lands directly adjacent to it. I began my hike by crossing the pedestrian and equestrian bridge that spans the Green River just below the outlet to the lower lake. 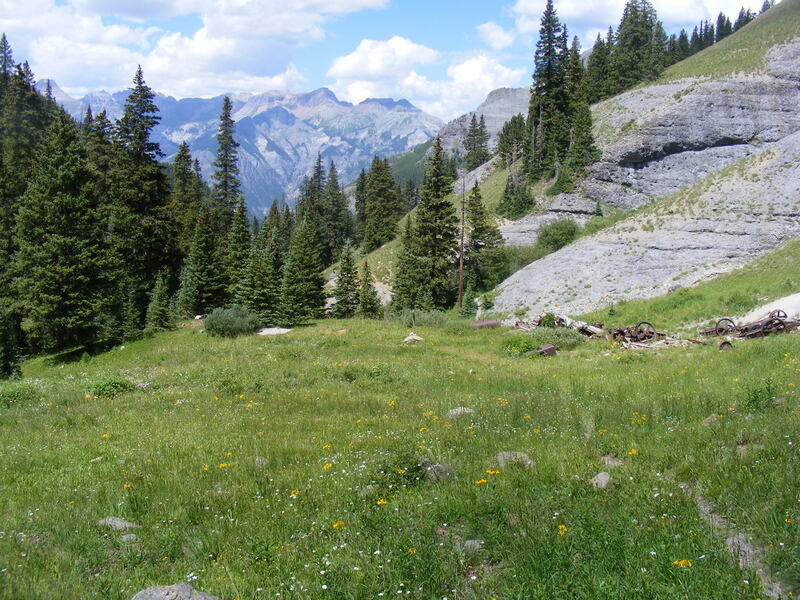 From there I hiked on the Highline Trail through large, open grassy meadows passing the occasional grove of aspen. 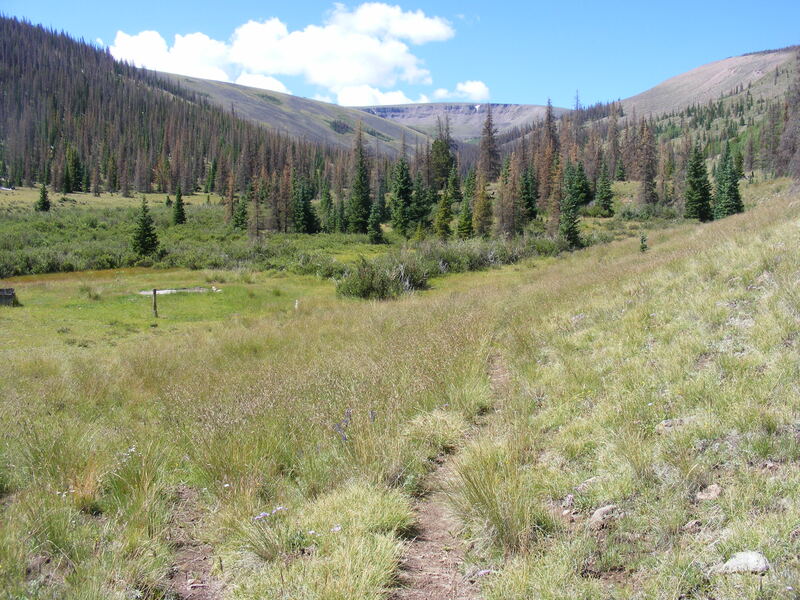 I made my way up and over a small divide that brought me to the Roaring Fork basin and the drainage of the same name. This basin was essentially a large meadow, serene in its autumn glory. I followed the trail to the bridge which crosses the Roaring Fork and hiked onward about another quarter of a mile or so. One of the highlights of this area is that the Roaring Fork is that branch of the Green River that directly drains off of Three Waters Mountain. 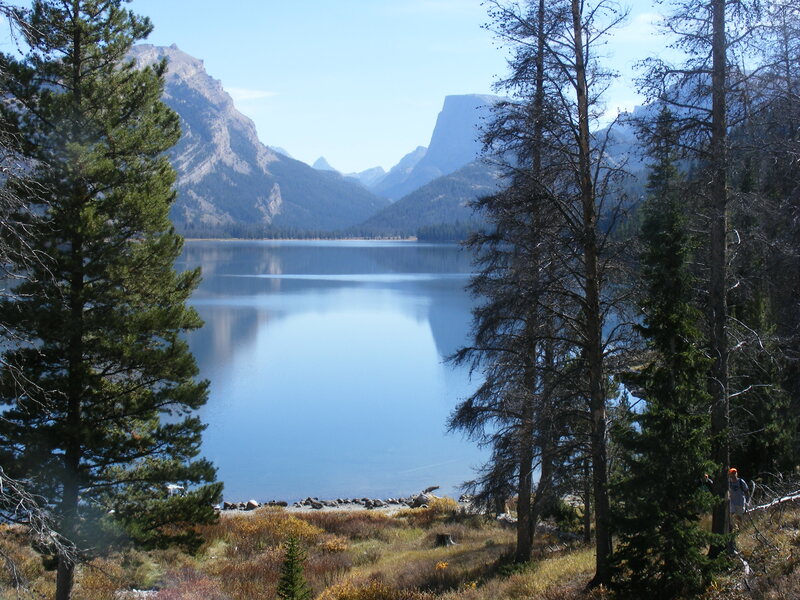 It is so named because that topographical point leads to the Green and Colorado River system, the Wind River and Missouri River system and the Gros Ventre and Columbia River system. I have a thing for triple divides, as they are geographically rare, and this is perhaps the most important one found in the region, if not the Rocky Mountains. Perhaps next year I shall make a foray to the summit of this mountain, but on this trip I had just enough time before nightfall to hike back to the campground. On my way up the trail I had seen a large herd of pronghorn, and along the way had glimpses of other wildlife. Because the Greater Yellowstone Ecosystem is home to the Grizzly Bears I was keeping an eye out for the great bruins, but didn’t see hide nor hair of any such creature. Nor did I see sign of any large predator. Near the summit of my hike, there is a fine lookout that allows a grand view of the upper reach of Green River where it makes the Big Bend and stops flowing north and begins flowing along its long southerly direction. Also, the far off summits of the Gros Ventre Mountains are espied on the distant horizon, adding to the scenery. On this fine autumn day, with mostly clear skies and moderate temperatures, I felt especially blessed to be out hiking in the golden fields of one of the most legendary places in the Rocky Mountains. Nearby to my own travels was one of the primary routes used by the mountain men of the nineteenth century. Although I have certain moral issues when any exploitation of our natural resources occurs, the history of the region and the discovery of the passes that allowed travel to occur on a continental scale does fascinate me. To be hiking in the same area that the Jim Bridger’s and Beckwourth’s saw with their own eyes is compelling and makes me appreciate the good fortune that has brought me here. I returned to camp just before the sun set and was able to take some time to sit and marvel at the towering magnificence that is Squaretop Mountain. This eminence towers over the Green River Lakes; it is hard to believe that any such still life can, un-animated, create such drama. I made a fire, cooked my dinner and, blessed as any could be, fell asleep contented and eager for the next day’s adventures. I decided to take a break from hiking the month previous to this hike. I had spent much time outdoors and was satiated; my home in Gunnison needed some maintenance and most of the time was spent painting and fixing. By the time I began to hike again in mid-September the greens of summer were slowly but inexorably turning to yellow as autumn was surely arriving. It seems that every year I make my way up to Lamphier Lake, tucked up in the Fossil Ridge Wilderness in the crease between Square Top, Fossil and Broncho Mountains. It is a fine destination of its own right, and there is an easy trail not found on maps that leads up to Square Top Mountain and other adjoining peaks. I have also hiked up the dividing ridge between Lamphier and Brush Creeks to the summit of Broncho Mountain where alpine sunflowers grow in profusion. On this hike I wanted to hike over the trail via Gunsight Pass and down into the basin formed by the upper reaches of Brush Creek. Brush Creek, unlike Lamphier Creek which discharges its flow into Gold Creek, drains into South Lottis Creek. Brush Creek can even be called the upper reach of South Lottis Creek. The hike up to the pass from the Gold Creek Trailhead was uneventful. I have hiked this trail several times, and it passes by quickly as I enjoy the change from lodgepole to aspen and then to sub-alpine fir and spruce. Most of the vegetation had taken on that particular shade of yellow and green that suggest the end of summer and the beginning of fall. Fall was still, technically, a few days distant but the plants will change color regardless of the date. The trail to the pass is rocky and steep; the north side of the pass in particular is rocky and not too well marked. I had made a quick stop at Lamphier Lake prior to crossing the pass. At the summit the shepherds and I rested a bit before walking down through a large talus field that would be challenging for equines to cross. The trails was disgorged out into a grassy meadow were the path was marked by a few cairns. It would have been a challenge to follow this trail further than I did, but it wasn’t an issue for me this day since I had intended to stop once I had reached Brush Creek. 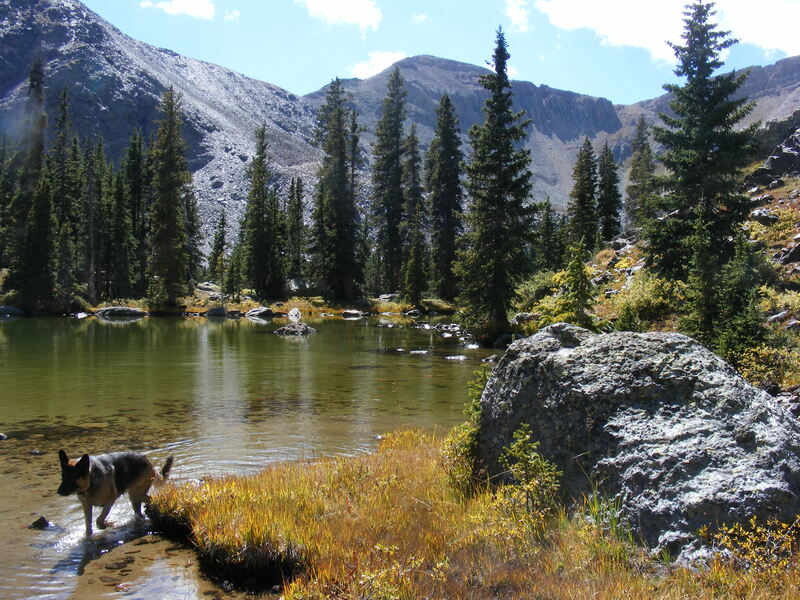 The Fossil Ridge Mountains are geographically small by Rocky Mountain standards but what is here is well worth the hiking. The scenery is classic Colorado high country, and the yellow grasses and shrubs combined with the green conifers and blue sky to add otherworldly color to this earthbound scene. I imagine that the trail is lacking definition simply because not many people make it to this valley. The dogs and I found a place to rest under a tree where I sat back and enjoyed the serenity and quietude of a peaceful high country valley. The wind was minimal and the sun warm, the combination keeping me warm and content as I enjoyed my hiker’s lunch while the dogs explored the nearby shrubs in the hopes of catching a rodent unaware. After an hour of lazy indolence, watching the clouds sail by and over distant ridges, we made the return trip back up and over Gunsight Pass to Lamphier Lake. We stayed a bit longer on the return trip, exploring the natural wonders as the ecosystem collectively prepared itself for the oncoming change into winter’s icy expanse. I paid a final fare-thee-well to some of my favorite species of wildflowers, knowing that it would be many months before I beheld them again in the next summer’s warmth. Mile after mile of winding, bumpy road led me to the Eddiesville Trailhead at the edge of the La Garita Wilderness. My goal for the day was to hike along the Machin Basin Trail to the headwaters of the Lake Fork of Cochetopa Creek. However, this hike, which should have been all vividly green was instead mostly a rusty brown. The vast majority of the conifers had been killed by beetle infestation; not only in the wilderness itself but the entire forest leading to the trailhead was devastated. The young trees seem alive for the moment, and the aspen seem unaffected, but in some stands the mortality for mature conifers was nearly if not one hundred percent. It was a challenge to find a live adult conifer. Even the small, diminutive mature conifers near treeline were not spared and if not dead already were activity dying. This mass die-off is a conundrum. Is it the first manifestation of global warming or climate change or a result of decades of well-meaning but harmful fire suppression? Forest wide beetle kills are nothing new, despite the hysteria surrounding them in contemporary times. My feeling is to let it run its course as I would advocate for any other natural phenomena, leave the dead boles in the forest to fertilize the soil and let Mother Nature heal her own wounds. We act as if we know all the answers or that somehow otherwise functioning ecosystems cannot get along without our guiding hand. Regardless of our intentions, though, nature will take her own course and perhaps it is time for us to stand aside, stop pretending we know the answers and let this epidemic run its course despite the pain of seeing large expanses of dead forest. Something, or things, will benefit from this die-off, even if we can’t see it or if it negatively affects our perception of what is aesthetically appealing. From the Eddiesville Trailhead, I walked up the Machin Basin Trail and climbed through the wide valley that the Lake Fork of Cochetopa Creek had formed. The grass and aspen were green and contrasted nicely with the dead conifers seen in all directions. The trail led some miles up and up at a steady grade until finally making the last ascent to the summit of the Continental Divide from where I could see into the basin that the trail is named for. This pass over into Machin Basin is near the junction of the San Juan Mountains, La Garita Mountains and the Cochetopa Hills. Water, or, rather, the lack of water, does not seem to be an issue with the decline of the forest. There was evidence of a decent snow-pack from the last year at least and the creeks were running with a surprising volume for mid-August. What should have been a fine view of Machin Basin was seen by me with the somber realization that nearly fifty plus miles of forest in this area was dead. I love nature, and am inclined to let her do her own thing, but this widespread devastation requires patience and has left me morally ambiguous about the correct path to follow. Nonetheless, the shepherds and I had a fine hike, visiting a place that most people would not see. The trailhead was busy today, but most of the folks visiting here were headed up to San Luis Peak, a well known fourteen’er that is well worth a visit. Having been there a couple times before, I chose an obscure path and, despite the beetle kill carnage, was rewarded with an intimate look and feel of the Rocky Mountains. Well, well, well…. I took only two photographs of this day’s adventure and I cannot recall where it was located. Since Leah is obviously wet it must have been near some water. Quite possibly, this was near the Taylor River, an easy place to access from my home in Gunnison, Colorado. The other photo shows two conifers in the shape of a vee and seems familiar to me, but I can’t place it. I do have a vague memory of hiking from the North Bank Campground east upstream and then climbing some rocks above the river and canyon, but I really can’t be sure with such scanty evidence. I suppose I should have either written down my location, or, better, would have been to take an adequate number of snapshots that would have allowed me to identify the location. Probably, I had wanted to get the dogs out of the house and get some activity and took my camera with us. Some day, I may find this spot again but it will be by accident. But, regardless, I’m sure I had a fine time making this brief foray into the Rocky Mountains of Colorado. Bear Creek is another of those ubiquitous names the unique use of which defies any possibility that the specific object described will be known to the general reader. So, the Bear Creek that I am referencing is that which drains into the Uncompahgre Gorge just south of Ouray, Colorado. This creek was scene to a part of the mining boom that occured in the region in the late nineteenth century; the negative environmental consequences in the forms of leached heavy metals are still to be reckoned with by this and future generations. Regardless of the drawbacks of said mining activity, some of the ruins in this area, the San Juan Mountains, are spectacular in their boldness and determination. The Bear Creek Trail has had added to its denomination the appellation National Recreation Trail. Many of the trails that cross and meander about the Rocky Mountains were built to grant access for sheep and cattle. Some, such as this particular one, were built to accommidate the mining industry. This trail has earned national recognition due to, primarily, its scenic majesty but also in no small part due to its unique and hazardous construction. Portions of the trail were literally blasted and carved out of the side of the cliff above Bear Creek and may be earnestly referred to as a cliff-hanger. The San Juan Mountains are a volcanic off-shoot of the Rocky Mountains. They are rugged, steep and some would say the most grand off all the various chains of mountains found throughout the interior western United States. That there is no lack of past mining activity should be no surprise since this area is part of the great mineral belt that runs more or less in a northeasterly-southwesterly direction from approximately Durango to Boulder, Colorado. Many, but not all, of the great mining towns were situated along this axis; Silverton, Leadville, Creede, Lake City, Idaho Springs to name but a few. 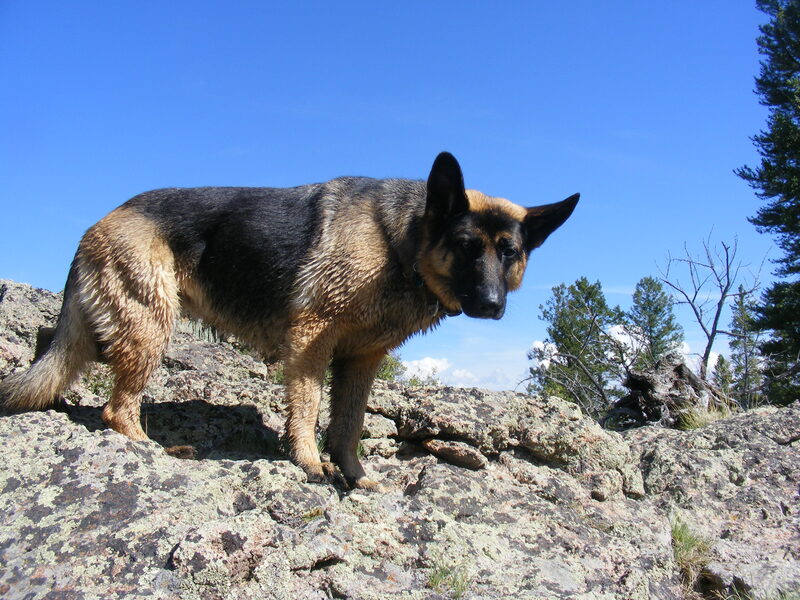 Although my two German shepherds generally display a strong inclination for self-preservation they do occasionally like to chase small rodents beyond what we would refer to, should such a fit of passion overcome a human being, as reason and rationality. Thus, due to the immediate drop-off of hundreds of feet that occurs along this trail, I decided to leave the canines at home and make this trek by myself. The trailhead for the Bear Creek National Recreation Trail is adjacent to U.S. 550; the highway must be crossed from the parking lot to the trailhead and then the trail makes a quick ascent and recrosses the highway over a tunnel used by the traffic below. This is followed by additional climbing through a series of switchbacks that lead to the main section of trail that clings to the cliff face hundreds of feet above the creek. In this first half a mile to a mile are fantastic views of the surrounding San Juan Mountains and the Uncompahgre Gorge. The trail is composed of pieces of flinty shale in this first section and the sound of footsteps is loud and resounding, as if someone were banging a hammer on a large piece of metal. This trail was once traversed by long lines of sure-footed mules and donkeys bringing up supplies to the mines and the miners. Now, this trail is used by those whose sense of vertigo doesn’t overcome the narrow, precariously perched trail. Strictly speaking, I have been on one or two official Forest Service trails, I can name one in the Sangre de Cristo Mountains, that have caused me a bit more concern, but this trail will take the breath out of all but the most indifferent or supremely composed persons. This is not the trail to trip over a rock in the path, else the unwary soul may be early bound for the world of the departed. Along the route are past signs of mining that bring forth imagery of dwarves as suggested by a recent and popular fictional series of moving pictures. There was one adit on a sheer cliff face that I can imagine must have been obtained by directly blasting a shaft from the top of the mountain. At another, denoted the Grizzly Bear Mine, were remains of a, for the times, in this case the early twentieth century, power plant of large generating capacity and other concomitant mining equipment. Despite the tangible remains of the past frenzy of human activity for the most part nature reigns supreme; water, un-diverted for industrial use, runs its course subject to naught but the eternal force of gravity and the vagaries of the surrounding rock’s density; the flowers bloom and add additional color to the green meadows while the aspen and sundry shrubs reclaim the disturbed areas; animated wildlife is seen and heard, returned to its home after previously been chased away; silence is the rule now that blasting has ceased and the stamps have been shuttered. That is my perception and I am glad for it; there are many people on this trail today who may, indeed, lament the passing of such a colorful part of our history and would wish for either partial or full industrialization. But all regardless of personal and political perspective are in awe of both nature and ruins, only the cynical not appreciating the one and the other. At the forks of Bear Creek lies another set of ruins larger in scope than the first. Here stands as of the date indicated in the title a two-story boarding house complete with dilapidated stove and rusty bed springs. Abandoned machinery is strewn about and within collapsed ruins and old rail which ore carts used to travel upon poke out of former tailings dumps. I stopped and inspected these ruins knowing that their demise was inevitable subject as it was to the relentless efforts of nature to reduce the inanimate yet shaped assemblages into their component atoms. Beyond the forks, I traveled up the North Fork past treeline and up into the alpine setting before crossing the unnamed pass that leads into Henson Creek, a tributary of the Lake Fork of the Gunnison River. I sat here, clouds sailing by, regaling in the grand vistas seen in all directions of the compass. This area is known as American Flats, but that name is only relative to the surrounding steep and well carved mountains that define the skyline. I remained for an hour or so, aware of the potential threat to my safety imposed by the potential for an electrical storm, but wanting to rest after climbing some four thousand feet in about six miles. Surrounded by mountains, grandeur produces a form of laughter derived from sheer joy; the mountains are truly a cure for all that ails you. The return descent was made along the same track that I had climbed up. The view and experience going down was just as thrilling as going up, and I stopped and lingered at many of the same places and added a couple of others. Overall, I had a fine and spectacular day in the San Juan Mountains of Colorado. Take a look at the pictures and then make haste to take this trek yourself! On the Bear Creek Trail – Don’t trip! Bear Creek Trail; yes, this is the trail – use caution!